Phase Two of the TUT-USM Summer School program brought its participants from Kota Bharu to Lake Banding in the Belum-Temenggor Forest Reserve. The purpose of this trip was for the TUT and USM students to work in pairs to collect data related to community sustainability. The Community Sustainability Assessment, developed by the Global Ecovillage Network, was used to gather data to provide an overview of each communities sustainability status. Data was collected in 10 indigenous villages over the course of two days. Upon arrival at Lake Banding, the group started their visit to the rainforest off with a trip the indigenous village of Air Banun. The TUT and USM students visited the projects that BRAINetwork has been working on with the Orang Asal of Air Banun, namely it’s kindergarten, cybercafé and community garden, all of which are being maintained and sustained by the Orang Asal. After the group visited the different projects, they engaged in games with the indigenous children, playing football, hula hoop games, frisbee and also making giant bubbles. 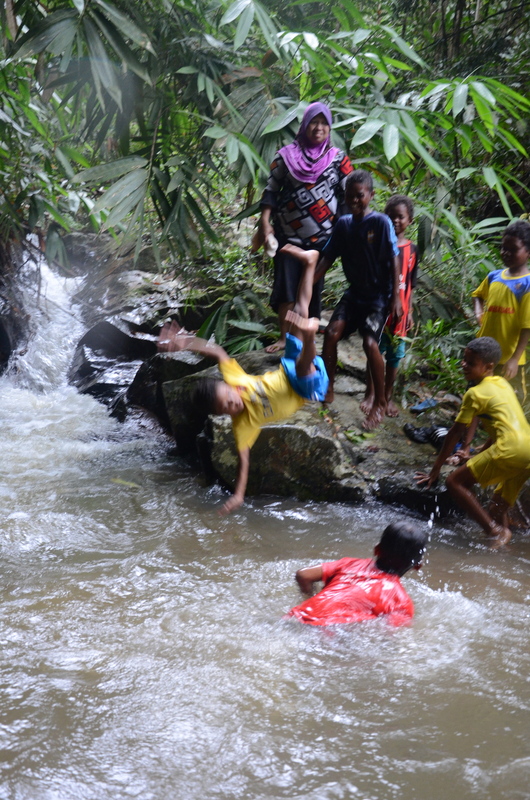 The children then gave the students an impromptu tour of their village including a short hike upstream to a small waterfall where the children showed off their acrobatic skills. It was a fun afternoon where the TUT and USM students got to experience a genuine and natural engagement through play with the indigenous children. Naoki Kanazawa, one of TUT students participating in the summer school program, said that “although I couldn’t speak their language and I could still engage with them, playing and making funny faces, I could feel their warm reaction to it”. In the evening, the summer school participants went on a night trek through the Temenggor Rainforest…and they were very grateful they didn’t encounter any hungry tigers! The next day the serious work started, each of the seven pairs of students were given the task of using the Community Sustainability Assessment to collect data in two villages each. The Community Sustainability Assessments were performed by each pair and entailed both, interviewing community members and also direct observation. The assessment is a questionnaire comprising of over 150 questions and takes roughly 2-3 hours to complete. The hope was that the students could identify some problem areas in the indigenous villages to which the TUT students could apply their engineering knowledge to develop potential solutions which could empower the Orang Asal to deal with their difficulties more effectively. The first day of data collection was performed in six villages located along Lake Banding, with the students travelling by speedboat to their allocated community. They were each dropped off at one village in the morning before returning to the boat in the afternoon for lunch and then proceeding to their second round of data collection in a different village in the afternoon. After a long day of interviewing and observation, the group finished the day in the indigenous village of Chuweh, where they got to experience using a blowpipe, as pictured below. While in Chuweh, Naoki and Kazuki of TUT and Fakhru and Shazwan of USM volunteered to help out for an hour with a community garden that BRAINetwork is assisting the Orang Asal of Chuweh to develop. After the students planted some fruit trees in Chuweh’s new community garden, the group returned to their hotel, the Banding Lakeside Inn. There, they had their dinner and also got to discuss and reflect on their data collection and experience in the indigenous villages. Day two of data collection saw the Summer School participants leave the hotel at 8:30am, on route to the indigenous village of Sungai Raba. The group were split in to two halves, with one half staying to collect data in Sungai Raba and the other half of the group travelling one hour by 4×4 to Tekam. It was a rocky journey for those in the 4×4 but an enjoyable one, as the deeper the journey went in to the rainforest, the more unique and picturesque views of the rainforest we got to witness. Both groups met in Air Banun when they had completed their data collection, they took a short break for some lunch before visiting their second data collection site of the day. Air Banun and Semelor were the communities assessed in the afternoon session. A heavy downpour that afternoon left the students soaking as they returned to the hotel, but this didn’t dampen their spirits or enthusiasm for an evening session of bamboo rafting at Lake Banding. The tired group of students got an early night ahead of their morning departure to Penang, where phase 3 of our Summer School would commence. 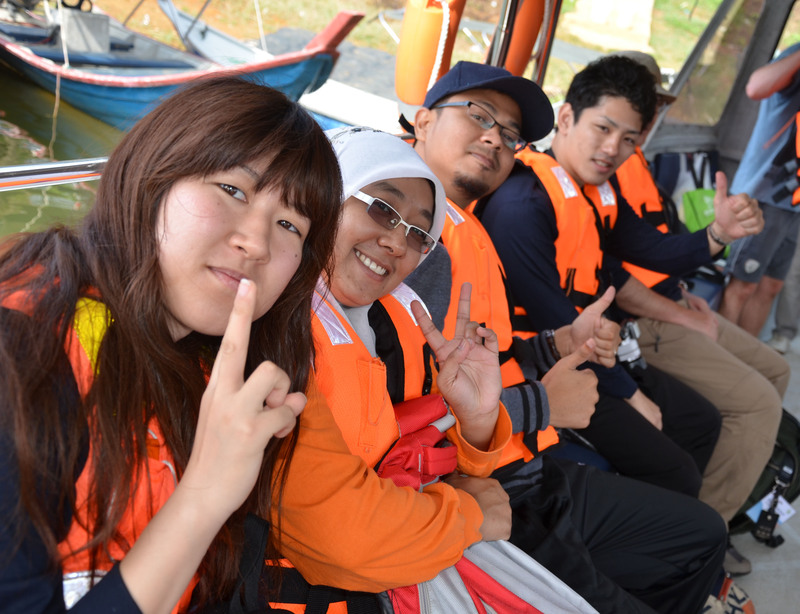 Before our departure for Penang, we had one more activity lined up, a visit to Pulau Banding Rainforest Research Centre. The research centre grows a number of small Merbau trees, which can be purchased for planting in the area. The Summer School participants, in their pairs, and also the TUT professors, selected a Merbau tree each to be planted in their honor. The USM students which participated in the Summer School program returned to Chuweh two weeks later, to plant their and their partners trees. The planting of the young trees can hopefully symbolize the budding relationship between USM and TUT and how this Summer School program can blossom if it’s sustained over time. The group received a tour of the Research Centre’s facilities before departing for Penang. Here’s a short clip of the groups endeavors in Phase Two of the Summer School Program. The song playing over the pictures was chosen for it’s fitting lyrics, “together we stand strong, our hands can change the world” and “together we are strong, our minds can change the world”. This reflects USM, TUT and the Orang Asal coming together, combining their knowledge and expertise to create sustainable solutions together. The song also has a second important message, that is, although we differ in our culture, tradition, lifestyle and backgrounds, at a biological level “we are all the same”, we’re all human beings, which is important to recognize considering the constant stigmatization and racism that the Orang Asal face throughout their lives.